Jack Kilbride’s Trad Session in the bar. 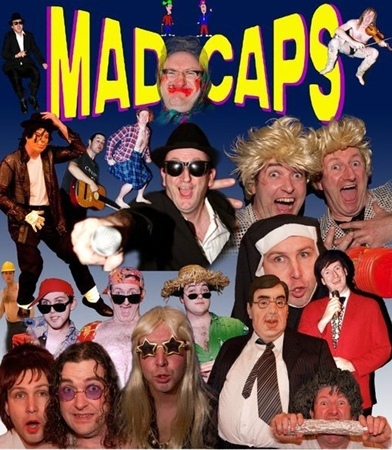 Madcaps and Trad for a fiver! 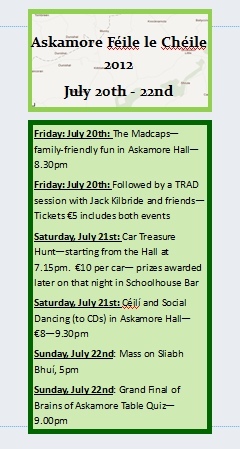 Get your tickets for the first night of Askamore Féíle le Chéile from any of the committee members: Jim Gilbert, Stacy Gilbert, Paddy Byrne, Mary Walsh, Mary & Davy Donohoe. Or phone Lorraine on 087-6975559. This year’s Féile will take place on the weekend of July 20th to 22nd, with the Brains of Askamore table quiz qualifiers happening on the previous Sunday, Tuesday and Thursday. 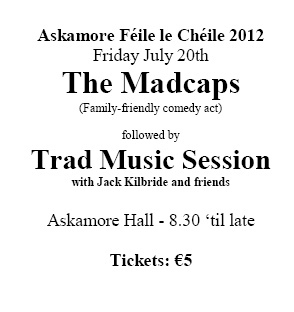 Féile le Chéile committee members will have the tickets on sale for the Madcaps, (read more about them here) followed by the trad session with Jack Kilbride – a snip at €5 for attending both events. Last year’s Brains of Askamore Table Quiz proved very successful, and was won by Joe Kenny Windowfitters team. This year’s quiz will have the same format, with qualifying rounds on the previous Sunday, Tuesday and Thursday. The 2 best teams each night, and the next 2 best teams over the 3 nights will send 8 teams into the Grand Final on Sunday 22nd. The qualifying rounds are standard table quiz format, but the quarter-finals, semis and final will follow match play format, which makes a very exciting and tense quiz. If you or your business or organisation or just yourself and pals as a team of 4 would like to enter, please contact Davy Donohoe (086 0820146) by Friday, July 13th. Entry fee is €20 per team of 4. Féile le Chéile Committee: Jim Gilbert, Stacy Gilbert, Mary Walsh, Mary Donohoe, Davy Donohoe, Paddy Byrne. Mass on Sliabh Bhuí will be in a slightly different venue this year, with Fr. Joe Power celebrating. Details of the location and how to get there will be announced later and it is once again hoped that a large number of people will walk to the venue.